The border area between Essex and Suffolk is one of England's best-kept secrets. Away from touristy Dedham Vale, the gentle hills rise higher ever westward beyond the Stour. Here are East Anglia's prettiest landscapes and prettiest villages, especially on the Essex side of the river. Bures has the best of both worlds, being partly in Suffolk and partly in Essex, that much-maligned, lovely county. The Suffolk part of the village is called Bures St Mary, because the medieval parish church is on the Suffolk side of the river. It has the pubs and the shops. You cross into Essex and enter Bures Hamlet, part of the parish of Lamarsh. Here is the railway station. The war memorial outside St Mary's church remembers The men of Bures St Mary and Bures Hamlet who gave their lives for King and Country in the Great War, and is perhaps the only war memorial in England to remember the dead of not just two separate parishes, but from two different dioceses in two separate counties. The gentle river that separates the two will sprawl out to half a mile wide before it reaches the sea at Harwich. 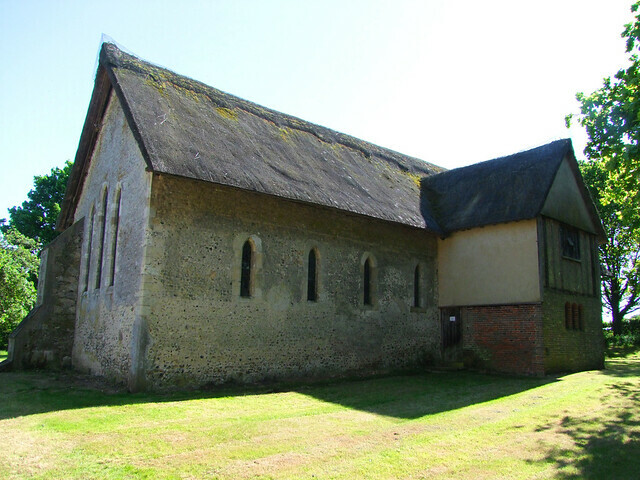 As historic as St Mary's church is, there is another building in Bures which is of at least equal significance, and which may be of older provenance. St Stephen's chapel sits on the Suffolk side, above the village but hidden from it. You leave town on the road to Assington. After about a mile there is a farmyard on the right, looking distinctly unpromising with sheet metal buildings and concrete hard-standing. A track leads through the farmyard and then continues for about half a mile. It doglegs eastwards suddenly, and there, with just a cottage for company, is this long, unassuming thatched building. One of the stories told about this place is that it was the site of the coronation of Edmund, one of the last kings of an independent East Anglia. Edmund was crowned in AD 855, when he would have been about 14 years old. The kingdom of East Anglia and the neighbouring kingdom of Essex were both already under attack by Viking raiders by this time, and both would eventually succumb, so it is not unlikely that the royal palace had been moved inland from the coast away from Rendlesham, the previous capital, and Ipswich, by then one of England's largest towns. However, there seems no evidence that this was the site of the coronation other than a 13th Century medieval legend, and nothing survives to tell of what might have been here in the 9th Century. By AD 869 Edmund was dead, slaughtered by Vikings at either Hoxne (Suffolk) or Hellesdon (Norfolk), depending on the county to which you owe allegiance. His remains eventually ended up at Bedricsworth, the modern Bury St Edmunds, and he was canonised by the early medieval church as St Edmund. The shrine at Bury was sacked at the Reformation, and the remains today are believed to lie in the crypt of Toulouse Cathedral in south-west France. As I say, there is no evidence to show whatever might or might not have happened here, but intriguingly, this remote Suffolk field was considered important enough in 1218 for the Archbishop of Canterbury, Stephen Langton, to consecrate this chapel. Canterbury did hold land in this area, as well as the patronage of the important nearby parish of Hadleigh, but whatever the reason for Langton's presence it must have been significant. At the time, Edmund was considered the patron Saint of England, a situation which would change a century later when Edward III associated St George with the Knights of the Garter. Edmund's star would set as George's rose, and the Reformation which destroyed his shrine would see St Edmund largely forgotten, but he remains today the patron Saint of East Anglia and is vigorously championed in some quarters as the true patron Saint of England. The original chapel forms the easterly two thirds of the building. It was consecrated on the Feast of St Stephen, December 26th 1218. At the Reformation, the need to blow apart any devotion to the former King of East Anglia meant that sites associated with St Edmund had to be dealt with particularly rigorously. The chapel was sacked, and once derelict was converted for use as cottages, and then as a barn. For the next four hundred years it was used for agricultural storage. The north wall was breached to allow access to large farm vehicles, and later the building was extended westwards. This extension is still used as a barn. In the 1930s, the Badcock and Probert families who owned it restored the eastern part of the building as a chapel, and it provided a home for some of the tombs of the De Veres, the Earls of Oxford, which had previously been at Colne Priory, just over the border. The De Veres were the great family of this border region, their star and boar decorating such great churches as those of Dedham, East Bergholt, Castle Hedingham and Lavenham among others, including Earls Colne itself. They inherited Colne Priory at the Dissolution, and used the chapel there as their mausoleum until the early 18th Century. The three tombs here are amalgams of perhaps eight that were at Earls Colne. Simon Jenkins thought that the tombs were good enough for him to include this chapel in his book England's Thousand Best Churches, and there is certainly a drama about finding them here in this lonely spot. The impressive effigies of the De Veres are by no means the only feature of interest here. At the east end is a good collection of continental glass of the 16th and 17th Centuries. It includes two matching figures of St Mary Magdalene and St Augustine, and a roundel showing the deposition of Christ's body in the tomb. Of greater interest still are two medieval panels, one depicting the scourging of Christ which must once have been part of a sequence, and another, fragmentary, which appears to show the Mass of St Gregory, a late medieval devotion in which the crucified Man of Sorrows appears on the altar to the future Pope as he celebrates Mass. This glass may well all have come from the chapel at Earls Colne. Three modern figures depict, in the 14th Century style, St Edmund, St Edward the Confessor and St Lawrence. Mortlock says they are by Henry Wilkinson. A transept built on to the north side of the chapel houses a mezzanine gallery which looks into the body of the church. At the west end is a continental statue of a bishop, which was probably collected in the early 19th Century by someone. Below it is what appears to be the shaft of a late medieval font - can it have come from here originally? Also at the west end is a memorial in the Arts and Crafts style. It shows an angel surrounded by foliage and holding a memorial plaque. The unfortunate effect is of a tortoise flattened to the wall, but when you get up close you see it is a memorial to Isobel Badcock who died loving and beloved in 1939. It records that she took great joy in the restoration of this her chapel and also remembers her brother-in-law Geoffrey Probert, who spent long hours here and contributed in every way he could to make it the perfect, lovely and worthy offering she desired. The narrowness of the building is accentuated when you stand at the west end and look eastwards. The massive tombchests give something of the effect of boats floating through a tunnel. At the far end, the triple lancets beckon you to something beyond them. This is a curious, lovely place, inevitably unlike any other church in East Anglia.